Welcome to Techno-Billies: DIY Grow Sacks! 1. I found some vinyl backed fabric (the stuff you can make washable tablecloths from) that was reduced down to £4.50 a metre. I reckon with a little jiggery pokery and perhaps a couple of extra seams I could get two large grow sacks from one metre. 2. I used a plate to draw around for the bottom of the grow sack. Then I put 5 eyelets in the bottom (so that the water can drain out). 3. The plate I used for the base had a 13 inch diameter and for those who know all about pi r squared (or something like that) it will be a simple matter to work out the diameter of the circle and how much fabric to cut for the walls of the sack. Or if you are arithmetically challenged like me... do it this way... take a long piece of string and measure the diameter of the base, cut the string to fit and then measure how much string you used. 4. I cut the correct amount of fabric with no seam allowance as such. Then I turned over a bit at the top and sewed it flat. You have to sew on the wrong side of the fabric because the vinyl side is very sticky and doesnt feed through at all. 5. Next I sewed up the sideseam. 6. Then I attached the side to the base. It puckered a little in places as I sewed - basically you are attaching a straight edge to the edge of a circle and that is never going to be easy - but I didnt mind it not being perfect... it is, after all, just a grow sack. 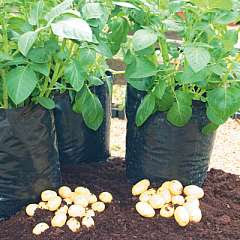 I think it will take two maybe three potatoes at a push so I will need to make some more. The intention is to plant some Jerusalem Artichokes too. I will let you all know how well it works as the season progresses. Great idea. You are quite creative. Come to think of it . . . I bet you could sell quite a few of those online or in your local area. I love this! I was given a whole heap of sacks that I am sure I could grow potatoes in. It is so important to try to grow as much as we can. well done! Hi Bill, yes I have thought about selling them... but to be honest, they were not very cheap to make... but I think they will last well... got to test them out first!